"All writers are observers, fascinated with human goings-on, but journal writers are a special breed, I think, suspicious of their own memories, like tourists taking snapshots of everything they see. They're different from diarists, of course – diarists seem, as a whole, fascinated with their own lives – journal keepers are snoops, fascinated with everyone else's life." Robin Hemley in "The Writer's Journal"
Not just any old snoop though. A fascination with observing leads to an awareness of how things and people affect their world, of how choices will cause actions that ripple out and subsequently affect the thoughts, senses and actions of others. People make choices, and over time these choices draw around them a signature of their likes and past actions. It is possible to know them and their values by being aware of the effects of their choices, of the ‘ripples of their existence’. Likewise buildings, organisations, animals, literally all objects can be defined by the combination of the effects acted and acting upon it, and of effects that it offers to others. Whether these are due to man, nature or time, the combination tells a story. Quite simply, nothing exists in isolation; simply by existing, an item will cause ripples that affect the world around it. 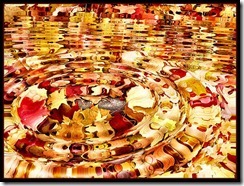 With practice you can become wonderfully attuned to these ripples that surround people, objects and events. By way of example, let us look at the poem “Mam” by Linda Senn. When Linda C Senn made a journal entry about her maternal grandmother, she didn't describe facts and dry details about her. Instead, she crafted a poem and used only the ripples generated by her grandmother to paint an emotional entry. The result leaves her grandmother ghost-like, shrouded in memories, whilst at the same time very tangible. I remember my grandmother, Mam. I still miss my grandmother, Mam. By Linda C Senn, from “The Many Faces of Journaling”. The images formed by this poem illustrate how rich an entry can be when journaling for creativity, showing how dissimilar to simple recording creative journaling is. Bear this in mind as you record entries in your journal. The child running across the park is more than just the physical vision of a child, look for the clues that tell you about the child’s home, the child’s nature, how it respects and is respected by others, what values the fledgling adult displays, the values of its mother, etc. Remember, journaling for creativity is not about writing a list of observations, it is recording the essences of lives lived. The ability to see these ripples around people and objects takes time to develop, so don’t be disturbed if, at first, you find it difficult. Keep looking for them whilst observing; eventually the necessary skill or rather the necessary ‘eye’ will develop. For those in a hurry, playing the journaling game “The ripples of existence” will help you develop this ability more rapidly, since the game uses creativity tools to enhance the learning. Photo credit: Faux Ripple, by Scott Robinson. "Awareness of the ‘ripples of existence’" by Andy Shackcloth is licensed under a Creative Commons Attribution-ShareAlike 3.0 Unported License.